8027ZS MEDIEVAL FIELD POWDER ART. 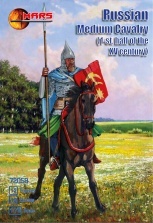 72059 Russian Medium Cavalry. 12 unpainted plastic figures. 6 different Poses. Material Plastic.